RCA Living Stereo — the gold standard for top quality orchestral performance and sound! 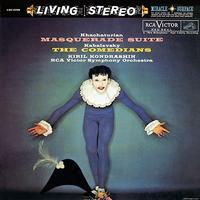 One of the best sounding recordings in the Living Stereo catalog, especially Side Two with "The Comedians." "In 1938, Dmitri Kabalevsky provided incidental music for a play produced by the Central Children's Theater in Moscow, titled 'Inventor and Comedian.' The score is light and witty and its expressive language quite direct, as was expected in Stalin's Soviet Union at that time. But here Kabalevsky was aiming at young audiences and had good reason to write tuneful, rather simple music. The play's plot deals with a traveling group of entertainers who are more clowns than comedians.